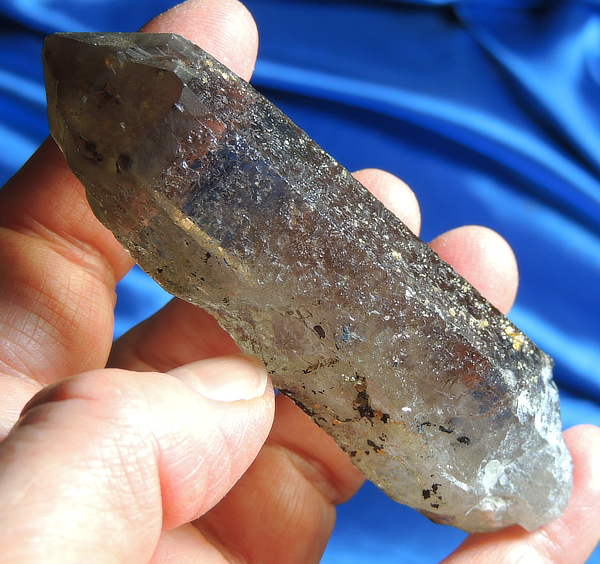 This is a gorgeous cathedraled crystal of slightly-golden smoky quartz with a healed base. There is a plethora of amazing garnet keys with bright orange garnets, scattered about … not many but they sure catch your eye! And check the photos as you can see some inside the termination as well. Her faces are beautifully glyphed and cathedraled … and you’ll see quite a few trigonic record keepers too! She is from China, is 3 oz and 3.5” by 1.05” by 0.95” and save for one very tiny ding, is in excellent condition. Somehow, she seems incongruous – peaceful and serene and yet, blazing with the fire of the orange-red garnets. But, she makes perfect sense. Too many times, we go through life, doing things over and over the same way. We take the same route to work, have the same exercise routine, eat the same foods, etc. As we become so routinized, there is a building stress. Routine is easier than making changes, but much less satisfying. What is missing is passion – the kind of passion you feel when you discover something new and delightful! This Spirit offers the energies to get you ‘over the hump’ and into trying new things, stretching into different areas, exploring change! On the one hand, she nudges you and on the other, there is a fierce protection so that the risk of change is mitigated. Now, her expertise is putting you in touch with that inner child … and allowing it to be expressed freely. That liberates your creativity and expression as you embrace life with a new passion. Allow her to take you out of the ordinary and experience the fullness of Life!